To test pure text print speed, we ran a 49-page text-only word document (with about 5% coverage) through the printer at 600dpi. Suffice to say that we were extremely impressed by the performance of the HP LaserJet 2420dn in this test. After a meager 5.5 second warmup time, the full document printed in 1 minute and 41 seconds. If you do your math, that's 29.1 ppm including the warmup time! Without the warmup time, the HP 2420dn racks up almost 31ppm, actually exceeding HP's specs for the printer. Very impressive. 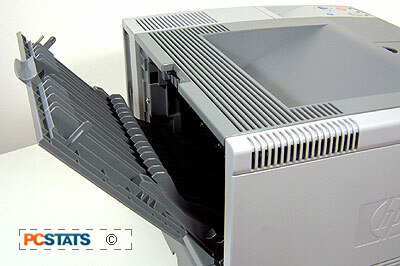 Looks like the HP LaserJet 2420 is set to tear through large documents with ease. Duplex printing dropped the speed down to a still-impressive 8.5ppm, while startup times remained the same. The lower-yield HP 2420dn toner cartridge costs $125US and yields ~6000 pages at 5% coverage. Taken at face value, this works out to about 2 cents US per page, while the larger $205US cartridge prints 12,000 pages for a CPP (Cost Per Page) of 1.7 cents. We've seen Canadian prices for the same toner cartridges at about $140 and $230 respectively, so CPP should be about 2.3 cents CAN for the smaller cartridge and 1.9 cents for the larger. These costs are about average for business laser printer operations. HP's direct pricing seems higher than many third-party retailers, so it should pay to shop around for toner. Overall, we were very impressed with the HP LaserJet 2420dn's capabilities as a medium-duty office printer. It's lightning fast print speed and miniscule warm-up times are its best attribute, but print quality is also excellent. As you'd expect with HP, the 2420dn is not particularly cheap, but the operating costs are on par with other office laser printers once you've got it running. With a recommended 75,000 page per month duty cycle, the HP LaserJet 2420dn is built to take the kind of jobs that medium/large offices can throw at it. The printer's power consumption is minimal when not printing, and since it takes less than 10 seconds to go from sleep mode to first page printed, there's no real tradeoff for this power economy. 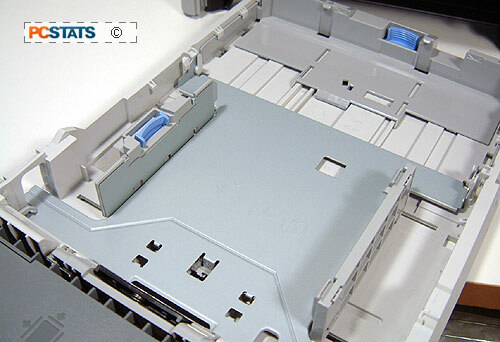 The HP LaserJet 2420dn offers a decent amount of expandability with its one free EIO port and spare DIMM slot. In our tests, network connectivity worked well, and the ability to create a customized driver installation complete with pre-set printer options is a great feature. The built-in HP JetDirect print server offers excellent functionality for larger offices, as most configuration tasks can be done remotely over the network, and email alerts and status reports simplify the job of caring for the printer. This feature, as much as the HP LaserJet 2420dn's printing abilities, makes it suitable for larger or dispersed offices. On the down side, the first LaserJet 2420dn we tested was DOA, which didn't boost our confidence in the model or HP's quality control standards. Anything can get broken in shipping though, and HP tech support were quick, polite and efficient. The replacement model worked just fine. We were also less than thrilled about the mottling that was present in some of our darker image and shading tests. This was much less pronounced at the 600dpi setting than at 1200dpi, and paper quality also seemed to contribute to or reduce this effect. If you need to produce crisp photographic images in dark shades, the HP LaserJet 2420dn does not appear to be an ideal candidate. For any other type of printing or graphic work, it's more than suitable. 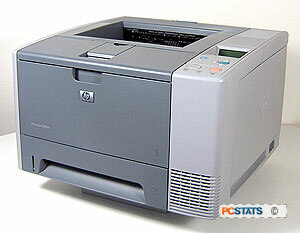 The Hewlett-Packard LaserJet 2420dn is a fast printer with some impressive networking features. It doesn't come cheap, but you wouldn't expect it to given its feature set and HP's reputation for business-quality printers. Here are a few other articles that you might enjoy as well.